President David Granger yesterday called on the international community to ensure that Venezuela is not allowed to thwart the processes of judicial settlement of a long-running border controversy with Guyana. He was at the time addressing the 72nd Session of the General Assembly of the United Nations (UN) in New York. “’Striving for peace’ and the right to development have been Guyana’s deepest concerns since Independence 1966,” Granger noted. He reminded the Assembly that a year ago he had explained the dangers Guyana has been facing on its borders as a consequence of the territorial claims of its western neighbour, the Bolivarian Republic of Venezuela. “Venezuela’s claim to Guyana’s territory, however, has not diminished or been diverted. Guyana remains imperilled. Disturbing developments within Venezuela have attracted the world’s attention and roused the concerns of many of us over the privations of its people,” Granger said, whilst drawing attention to the internal conflict in the neighbouring territory. Granger informed the representatives of the globe that Venezuela, a country four times the size of Guyana, has made claims to two-thirds of Guyana’s territory, including its maritime space. 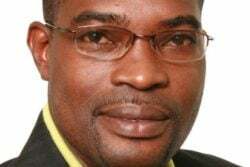 These claims threatens not only the Caribbean’s wish to be a Zone of Peace but the resources that Guyana is depending on for its development, he declared. “The Venezuelan claim persists after fifty-one years of Independence. An eminent international Arbitral Tribunal provided ‘a full, perfect and final settlement’ 118 years ago in 1899. Venezuela denounced that Arbitral Award in 1962 at the Decolonisation Committee of this Assembly as British Guiana strove for its Independence,” Granger, a historian, informed the gathering. “Guyana warns the world, through this Assembly, that peace will be at stake in our region if justice does not become ascendant, not only within Venezuela, but also in respect to its border controversy with Guyana. “Four UN Secretaries-General have been seized of the Venezuelan claims. The choice has become one between just and peaceful settlement in accordance with international law, and a Venezuelan posture of attrition that is increasingly more blustering and militaristic. In this matter, protraction is the enemy of resolution and the ally of sustained conflict,” the president observed. Former Secretary General Ban Ki-moon and current Secretary General António Guterres, both publicly indicated that they have decided that if under the 1966 Geneva Agreement significant progress has not been made toward arriving at a full agreement for the settlement of the border controversy, by the end of this year, the International Court of Justice will be the next means of peaceful settlement, unless Guyana and Venezuela jointly request otherwise, Granger added, noting the important role the UN is playing in the resolution of the border issue. 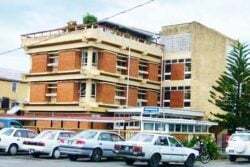 “Guyana has been working assiduously with the Secretary General’s Personal Representative. Guyana looks to the international community to ensure that Venezuela is not allowed to thwart the processes of judicial settlement which is the clear and agreed path to peace and justice,” Granger stated. Speaking earlier on the theme of peace, the president noted that “‘Striving for peace’ must be humanity’s quest and the United Nations is the paramount global instrument of peace and has a vital role to play to ensure respect for international law through the International Court of Justice and the Security Council. 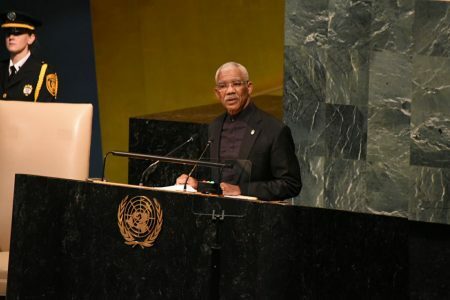 Granger reiterated Guyana’s support for the reform of the Security Council to give even greater voice to developing countries, a two-state resolution to the Palestine-Israeli conflict and the withdrawal of the economic embargo against Cuba. “Peace for the world’s peoples is the mandate of the United Nations. Peace can be achieved by addressing the world’s humanitarian crises, promoting justice within and between nations and resolving long-standing conflicts between states,” Granger stated.